This is one of the most personal and poignant sculptures I know. It was a kind of retirement project for Michelangelo, who intended it to stand over his own grave. After 1545, when he was 70 years old, Michelangelo accepted no further commissions for painting or sculpture, although he was still busy with various architectural commissions such as St Peter’s and the Capitoline Hill in Rome. Nevertheless, he continued to sculpt every day until only a week or so before his death in 1564. So we can imagine him in these years around 1547 to 1555 working on this piece, bit by bit, daily shaping its form. He abandoned the work in 1555 for reasons that are unclear and another sculptor worked on parts of it, especially the female figure on the left. Nevertheless, there is more than enough here to show us Michelangelo’s intent, especially in the figure of Nicodemus, who stands over the group and enfolds them, bearing Michelangelo’s distinctive self-portrait. The composition is unusual. It is known as a Pietà, but that usually involves only Mary the mother of Jesus mourning over the body of her son, although sometimes she is assisted by another figure, such as Mary Magdalene. 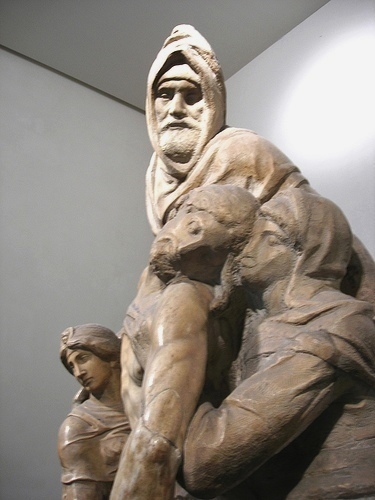 The figure of Nicodemus is usually restricted to images of the Deposition, as we know that he assisted Joseph of Arimathea in taking down Jesus’ body from the cross (John 19:39). By introducing Nicodemus into a Pietà and imposing his own features on the figure, the artist is clearly making a point of his own personal identification with the Lord’s sacrifice. With his extraordinary grasp of three-dimensionality Michelangelo gives us different insights into the scene. From the front Nicodemus stands tall, not in any way competing with or imposing himself into Mary’s closeness to Jesus. He has helped to take down the body. Now he is doing what he can to take the weight of the body, while standing in silent unity with the two Maries. But from the side, as the heads align into a very narrow triangle, one senses a much greater personal closeness of the artist to the Lord. Since the 1530s Michelangelo had been involved in a Protestant-inspired Bible study group that met once a week to read and discuss the Bible. From this time his poetry shows a sudden and profound grasp of salvation by grace, not by works. Sadly, with the Counter-Reformation beginning in the 1540s all the other members of the group were persecuted or driven into exile. Then in 1547 one of Michelangelo’s dearest friends, Vittoria Colonna, who had been forced to recant under threat of torture, had died. Perhaps it was this loss that inspired him soon afterwards to start work on this Pietà. Even though Pope Paul IV robbed Michelangelo in 1555 of his pension, he was spared persecution, presumably because of his fame and the importance of his work in the Vatican. Nevertheless, his sympathies were known. 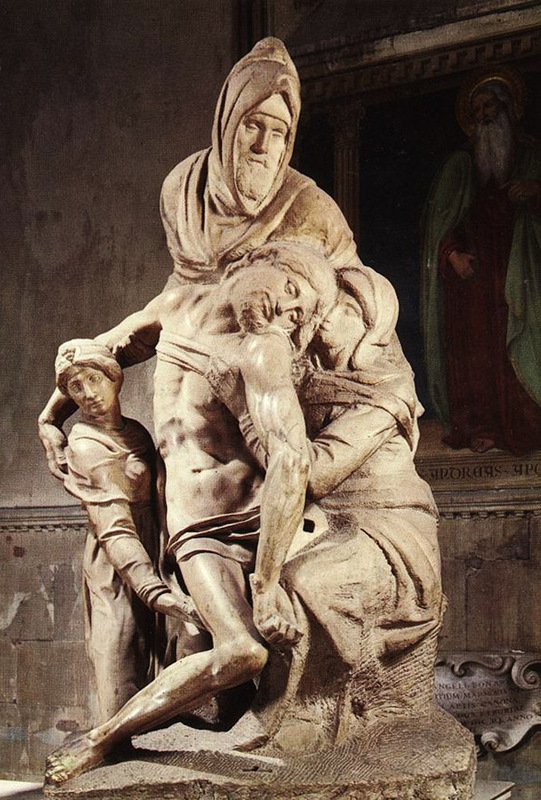 When in 1549 a copy of his Pietà from St Peter's was installed in the church of Santo Spirito in Florence, an anonymous letter was circulated which described him as ‘a respecter of art but not of devotion’ and described the work as a ‘Lutheran caprice’. Certainly, in The Florence Pietà there is an emphasis on the deadness of Christ’s body, characteristic of Protestant art. In the Renaissance, so heavily influenced by Platonism, there had been a reluctance to engage with the reality of God himself suffering the horrors of the cross. Some works, for instance, show Jesus as if he were asleep rather than dead, showing scarcely any signs of physical harm. With the Reformation’s emphasis on salvation by God’s grace, the notion that Jesus truly died on the cross in our place returns to the theological centre. This is the emphasis we see in this work. The figure of Christ is unusually awkward and emphatically dead. And Michelangelo looks down over this fallen figure with sad and quiet reflection. But he looks from within the hood of Nicodemus. Many Christians have come to regard Nicodemus as a bit of a coward for coming to Jesus by night (John 3), presumably because he was afraid of his fellow Jewish leaders. However, Italian Protestants of Michelangelo’s day were much more sympathetic to his predicament. For they knew that, if they publicly aligned themselves with Protestant doctrine, it would mean persecution and death. Michelangelo identifies himself with Nicodemus, an old man who has grappled with Jesus’ statement that he needs to be born again and who now clings in faith to the crucified Jesus through whom alone that new life can come. 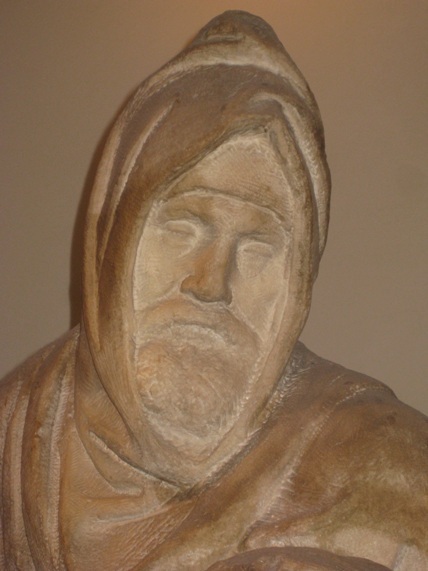 It would have been a great work of funerary sculpture – full of humility, faith and hope! Michelangelo: The Florence Pietà, 1547 – 1555, Museo dell’Opera del Duomo, Florence, Italy. Michelangelo Buonarroti (1475-1564) was an Italian Renaissance sculptor, painter, architect and poet. He is generally considered one of the greatest artists ever. He worked in Florence and Rome. As a student in the household of Lorenzo de' Medici Michelangelo met some of the greatest thinkers and artists of his days. In 1496 he moved to Rome, where one of his first major assignments was the now well-known Pietà in St Peter's Basilica. Back in Florence Michelangelo created several other masterpieces, including the David (1501-1504). Pope Julius II commissioned him to decorate the ceiling in the Sistine Chapel (1508-12). The frescoes depict prophets, sibyls and scenes from Genesis, translating from sculpture into painting Michelangelo's preference for strong, muscular figures. He returned to the Sistine Chapel in 1536 to begin the huge Last Judgment on the altar wall, finishing the work in 1541. In 1547 he was unwillingly put in charge of the rebuilding of St Peter's, and had a decisive influence over its final design. Michelangelo died in Rome in 1564. He is buried in the church of Santa Croce in Florence.